Approximately 5 Usable Acres (Upland) Property adjoins The Island West Golf Course, a Goodwill Industries Store, and Stokes Toyota. Great Oceanfront Opportunity! 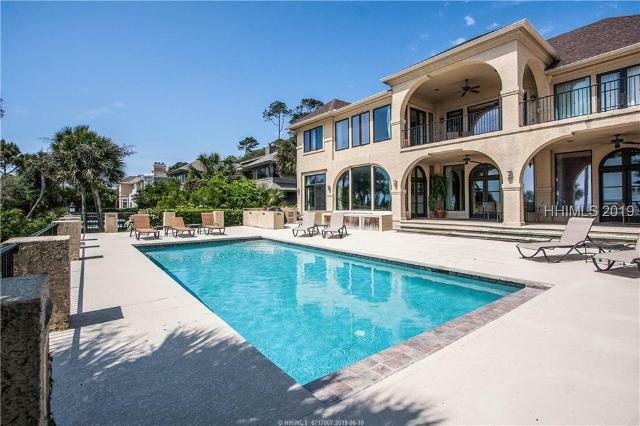 5 BR, 5 BA beach home with unique design features including an entry with a grand dual staircase, 2 fireplaces and a chefGÇÖs kitchen with a Viking gas stove. Expansive ocean views from 2nd floor living/dining/kitchen area and master bedroom. A sparkling pool surrounded with a spacious patio is perfect for outdoor entertaining. Possibly the best value in a Sea Pines Oceanfront Home! Stunning 2nd row architectural gem is located on the GÇ£Gold CoastGÇ¥ of Hilton Head Island. Immaculately maintained by the owners, this home has it all! Could be an unbelievable rental property with 5 bedrooms (each with private bathrooms), a large bonus/game room and a beautiful office, 2 laundry areas, chefGÇÖs kitchen and 2 gracious living areas. Living is easy on the extensive screened in porch overlooking the private pool and spa surrounded by lush landscaping. You can see the ocean from the back but per owner you can stick your toes in the sand in 121 steps (give or take a few). 4 car garage and too many upgrades to list here.